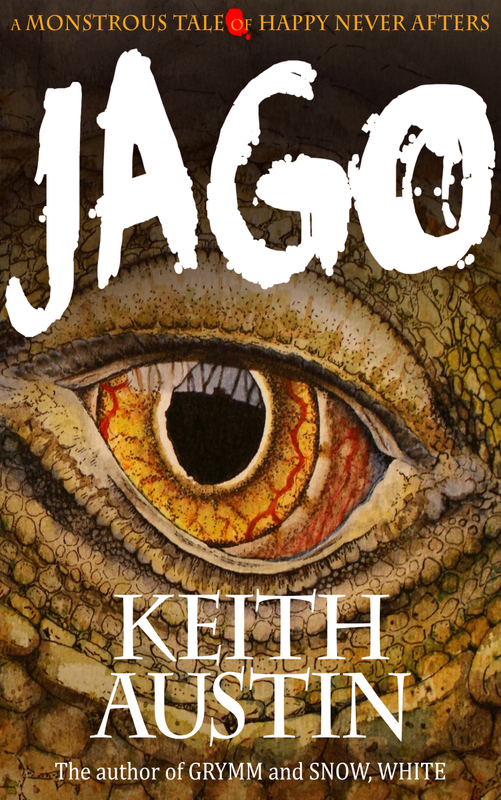 Having read and savoured every single word in Keith Austin’s awesome book Grymm, it took a good deal of self-control to refrain from cracking the spine on his most recent offering for Young Adult readers, Jago. With the housework in order, I finally succumbed to the temptation over the weekend and I wasn’t disappointed. Set in the world of Victorian England Jago tells the story of 11 year old Demelza Cotton and Jago Quinn, a pair of street urchins who roam the streets of London’s Old Nichol slum. Austin skilfully brings alive the voice of Demelza as she describes her pitiful existence, barely surviving alongside her friend Jago as they eke out a miserable existence through petty crime. When the two friends discover an unusual lizard with rainbow coloured skin, an adventure begins in which their lives and the strength of their friendship is challenged. The lightly gothic elements of Jago ensure that the book will have strong appeal with both boys and girls in the Middle Years. This is a short read (incidentally I never wanted it to end) making it the perfect length for shared classroom study. The title links well to the National Curriculum for History; with its strong focus upon the Victorian and Industrial era, especially for year 9 students where this is a key focus. Teachers will appreciate the many references to living standards, the structure of society and the high rate of poverty and crime during the period. The book might also incite a discussion on diverse topics such as Chinese culture, dragonology and Jack the Ripper. Furthermore, the book serves as a perfect entry point for examining the life and work of writers from the period such as William Blake and Charles Dickens. I was impressed by this book on many levels, not least because this work is self-published. However, I did feel that a little more explanation relating to the origin of the lizard was needed, although I was not too perturbed, since the story is otherwise utterly engrossing. The only other concern I have for this title is accessibility. The book is currently available in print albeit in limited numbers and although it is available as an e-book, I fear that this will discourage its purchase by schools. With richly drawn characters in an unforgettable landscape, Austin takes his readers on a memorable and faced paced journey into a slightly steampunk and Dickensesque world. A must-have title for every school library. Jago is currently available in hard copy format and as an e-book on Amazon Kindle. I’m a little ashamed to admit that I am naturally drawn to the dark side in my reading. I’m not a particularly dark person but I love the literary richness of the Gothic genre. It possibly goes back to my university days when I became acquainted with Mary Shelley. More recently, in the classroom I have had a great deal of fun introducing students to the likes of Neil Gaiman through his film adaptation of his awesome book Coraline (2009). I remember reading somewhere that Neil Gaiman has ‘nearly’ created his own genre in the world of literature. I’m not sure about that, but he does offer something unique. For me it is his distinct perceptibility that enables him to reach into our darkest fears and insecurities that I appreciate most. In many ways Keith Austin’s book Grymm reminded me of this. Grymm is set in the desert town of the same name. Once a thriving hub for the mining industry, the gold deposits have since dried up, leaving Grymm as a fading ghost town. Jacob and Mina, step-siblings with a distinct lack of appreciation for one another, land in Grymm with their parents and half-baby brother Bryan. From the moment they arrive they have an inkling that things in Grymm are not quite as they first seem. It doesn’t take long before their hunch is confirmed by the sudden disappearance of their baby brother. The outback desert town Austin has created is darkly mysterious, and every bit as sinister as a Transylvanian-esque village in the European mountains might be. On many levels the town is quite stereotypical; although I did appreciate his hints to the Aboriginal Dreaming and the proliferation of flies that suggested something more Australian. Grymm includes a host of vividly drawn characters, all equally grotesque in their own way. Of particular note was the cross-dressing Maggot (who likes to add maggots to milkshakes), the larger than life baker Fleur, (who may or may not want to add the children to his latest creation), and Real Estate agent Thespa, (a voluminously hideous woman that conceals a heart of gold or possibly a taste for infants?). Also of note was the local butcher Cleaver Flay who was reminiscent of another insane butcher from film history, Clapet from Jeunet and Caro’s French cinematic masterpiece Delicatessen (1991). As with any great Horror/Gothic tale what is needed is the evil antagonist who must act as the Master Puppeteer. This role is taken by the insidious Anhanga, who despite living up to my expectations, was introduced to the story a little too late for my liking. This is quite a chunky book which for practical purposes will possibly make it a little tricky to use in the classroom as a shared text. However, it is definitely something that I would happily use excerpts of, alongside film as part of a Gothic/Horror unit at grade 9 level. I have already mentioned parallels with this text and many of Gaiman’s titles (especially Coraline (2002) and The Graveyard Book (2008)), however it would pair equally well with, and provide extension for students who enjoyed Lemony Snicket’s A Series of Unfortunate Events (1999-2006) series. 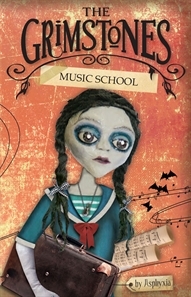 It might also be worthwhile having a look at the short novel The Grimstones: Music School (2013) by Asphyxia. Despite being written in language that is widely accessible, some children at the lower end of the Middle Years, may find some of the content a little distressing so I would pitch it to students closer to 14 to be safe. A vividly drawn Gothic-Horror title with a dash of Steampunk thrown in for good measure. 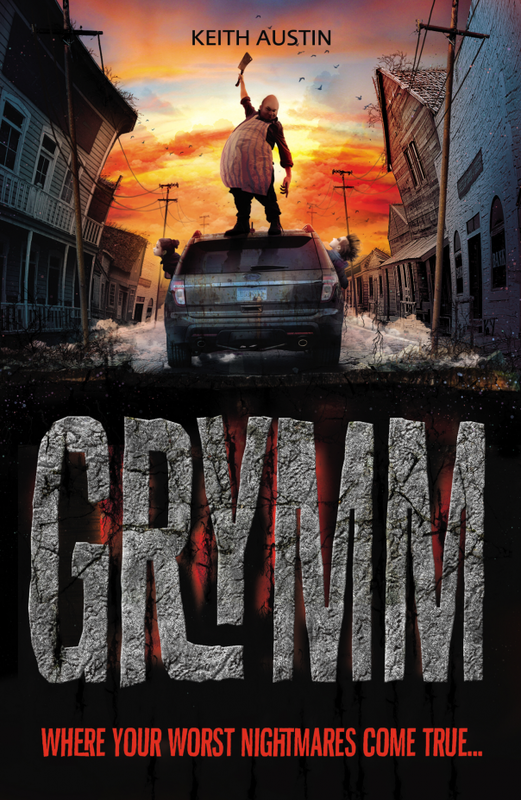 I highly recommend Keith Austin’s Grymm for a delectable read on a dark night. Word of warning. This title is best consumed without food. Hello, I’m Martha Grimstone, and at last I’m here in the big city attending the Queen’s Music Academy, where so many famous musicians made their beginnings. I have my very own wing at Lady Sterling’s manor, and I’m excited beyond words, for soon I’ll learn how to use my music to turn back the storms that threaten my valley. I simply cannot wait for my teachers to show me all I need to know. But why won’t they let me play my own compositions….? “The Grimstones: Music School” is a gothic fairytale about a new friend with the wrong name, a family of uncooperative bats, and what happens when a school of very great tradition encounters all the four seasons in one day. I don’t generally read middle grade fiction but my ten year old daughter’s enthusiasm for this title had me intrigued enough to dedicate an afternoon to this little book. Initially I was skeptical. Is this another book capitalising on the gothic/steampunk trend in children’s and adolescent fiction at the moment? I doubted it would reach the high standard set by the likes of Neil Gaiman and Lemony Snicket (Daniel Handler). It didn’t, but then again not many authors do. However, what Asphyxia’s story lacks in literary merit she makes up for in other ways. Her world is undeniably spellbinding and her central protagonist Martha is appealingly eccentric. However, what impressed me most was the unique approach to storytelling that utilised a variety of text types including letters, diary entries, lists, notes, invitations and a selection of mesmerizing illustrations and photographs. I loved the quirky and organic nature of this book. Students will undoubtedly enjoy exploring the story behind the book through the companion website and online clips. Having done this myself I did question whether this journey would have been more faithfully reflected through an even larger book with greater emphasis on the images and less on text. In short, I wondered if the project may have functioned better as a picture book. Although this story is clearly marketed towards middle grade students I feel strongly that it may draw a much broader audience than this. There is great scope for using this with students across a range of curriculum areas, including the Language Arts, Visual Arts, Music, Drama and Technology. It should hold strong appeal as a shared text for classes in the lower end of the middle years and it provides substantial opportunities for students of all grade bands to investigate multiliteracies thus supporting their own text production. **Allen & Unwin provided me with a free review copy of this book. I have otherwise not been paid or rewarded for any review or endorsement of this book and the above opinions reflect my unbiased view.